Lightweight scheduler sampling brings statistical model checking to nondeterministic formalisms with undiscounted properties, in constant memory. Its direct application to continuous-time models is rendered ineffective by their dense concrete state spaces and the need to consider continuous input for optimal decisions. 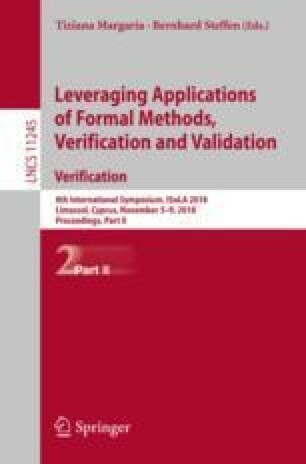 In this paper we describe the challenges and state of the art in applying lightweight scheduler sampling to three continuous-time formalisms: After a review of recent work on exploiting discrete abstractions for probabilistic timed automata, we discuss scheduler sampling for Markov automata and apply it on two case studies. We provide further insights into the tradeoffs between scheduler classes for stochastic automata. Throughout, we present extended experiments and new visualisations of the distribution of schedulers. This work is supported by the 3TU project “Big Software on the Run”, by ERC grant 695614 (POWVER), by the JST ERATO HASUO Metamathematics for Systems Design project (JPMJER1603), and by SeCyT-UNC projects 05/BP12, 05/B497. The authors thank Yuliya Butkova (Saarland University) for clarifying discussions on uniformisation and the time-bounded analysis of MA.